Our featured dessert is original prepared only with blueberries. But we were given Bosc pears, and they are very good eating. We decided to use them as an addition to the bread pudding. The Bosc is a cultivar of the European Pear grown in the northwestern U.S. states of California, Washington, and Oregon. It is also cultivated in Australia, as well as in British Columbia, and of course Europe. In Europe it is sometimes referred to a the Kaiser pear. The featured recipe was prepared in video format, please enjoy. The recipe follows at the end, and you can also copy it were it is posted below the video. In a large mixing bowl; combine eggs, cream, sugar and vanilla. 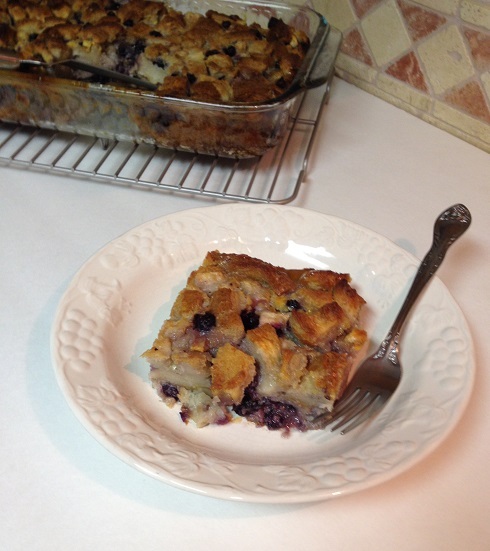 Stir in blueberries, pears and baking chips. Mix in bread cubes; let stand for 15 minutes or until bread is softened. Transfer to a greased 13×9 inch baking dish. Bake, uncovered, for 50-65 minutes or until a knife inserted near the center comes out clean. Let stand for 20 minutes before serving. *With the presence of sugar in a recipe, using salt can require less sugar. The original recipe calls for 2 cups sugar but no salt. By adding the salt, less sugar is needed. The salt brings out the sweetness of the sugar, and making it seem as though you put two cups. 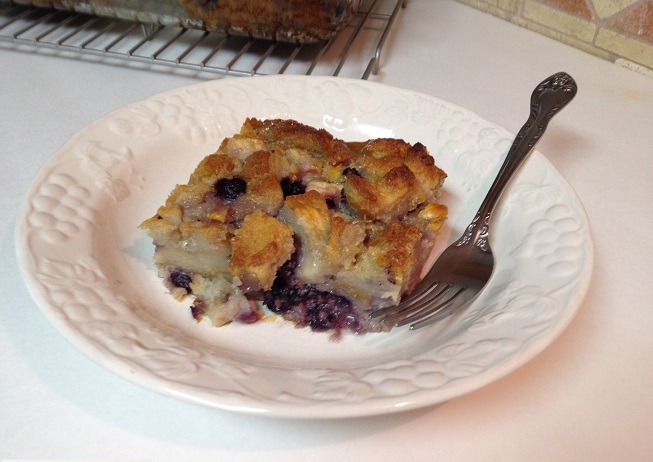 This entry was posted in Dessert and tagged Baguette, blueberries, Blueberry, Bosc pears, Bread, Bread Pudding, British Columbia, California, Casserole, Europe, European Pear, Oregon, Pear Varieties, White Chocolate Bread Pudding. Bookmark the permalink. I have heard of bread pudding but never seen it before. It looks delicious and easy to make. Hey Honey…How are you? Thanks for stopping by. I hope you give the recipe a try. See though about a glute free bread, though. That way you will enjoy it now, and not pay for it later. Ghirardelli white chocolate is the best! Most other brands use fact, imitation ingredients. I tried a white chocolate by Hershey’s and the dessert wasn’t the same. Pass this one on to Aaron, 100% easy to make and 100% guarantee to enjoy! !